We all love the idea of discovering a treasure, but how many of us will actually take the time to go on a treasure hunt? 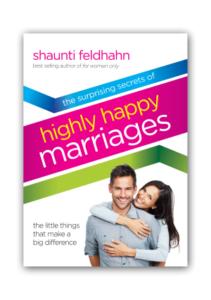 Well that’s just what Shaunti Feldhahn has done in her new book, The Surprising Secrets of Highly Happy Marriages. After working my way through these pages and pondering these gems of wisdom, I couldn’t help but wonder how many marriages might have been saved had they understood these simple, attainable truths. If you’re happily married this book will affirm what you’ve been doing right and equip you to finish strong. If your marriage hangs by a thread, I believe this book will help put you back together again. Thank you, Shaunti, for another revelatory book!